Canada after a heart-breaking loss to France on Day 1 which prevented their entry to the Cup round salvaged some pride with a win over Scotland and a trip to the Challenge semi-final where they lost to Argentina. That earned them 5 series points which seems the norm for the team this year with a 5-5-10-5 record after 4 tournaments. They're ahead of the relegation pack of Wales (11), Kenya (12) and Japan (11) at the present time which is essential. Next up is Vegas and Vancouver in March. Hopefully Justin Douglas and Harry Jones will be available for those tournaments. Connor Braid has been the outstanding player in the recent NZ/OZ tournaments with Cole Davis providing a strong backup performance, a welcome addition to the squad. The Rugby Canada match reports are below. Canada open up day two of the Sydney Series with a win against Scotland in the challenge trophy quarterfinals, 35-21. It was all Canada in the first, starting with a grubber by Nathan Hirayama that was scooped up by Isaac Kaay for a try. A long missed pass from Scotland resulted in a Canadian scrum on their 5 metre where Adam Zaruba found Pat Kay who brought it in for a score. Kay followed that up with another try shortly after from a Matt Mullins pass. Mullins then scored a try of his own, powering his way over the Scottish line. Hirayama added on 4 conversions to put Canada ahead 28-0 at the break. In the second Canada allowed three Scottish tries in a row to put them back in the match. But another textbook Zaruba offload got into the hands of Kaay who scored his second try of the match and secured the victory for the Canadians, 35-21. Hirayama added on the two points. Canada end the Sydney Series 11/12th after a loss to Argentina in the Challenge Trophy semifinals, 24-19. After a strong start by Argentina, Adam Zaruba scores a shorthanded try to get Canada on the board in the first half. Canada get off to a quick start in the second half with a try by Jake Thiel who shows off his wheels to burn past the Argentinian defense. Connor Braid followed that up with a run of his own, going 70m to score Canada's final try. Nathan Hirayama had two conversions in the match but it wasn't enough to top Argentina, who take it 24-19. Canada's path was determined in one key play in the match versus France. The game was tied at 12-12, Canada just won the man advantage with France getting binned and there's 1:42 left on the clock. Canada had worked hard to run the ball out from their 5 metres and were now about 35 metres out. Do you take the lineout at about midfield or go on the attack with the man advantage. Canada chose the former option despite having a newly capped player throwing in, it went low, bounced off the chest of Isaac Kaay and France went on to score short-handed. It was tragic as Canada find new ways to lose games. A win would have put them in the Cup round, giving them more series points and a better draw at Vegas which would have likely given them a better draw at Vancouver. Now they're in the Challenge round and face Scotland a team they've struggled against. Two players who are carrying more than their share of the load are Connor Braid and Cole Davis, topping the performance chart after Day 1. Below are the match reports from Rugby Canada and the CBC Sports match videos. Canada fall to France 17-12 in their second match. A game riddled with yellow cards, France go up 7-0 early in the first half. A scoring opportunity for Pat Kay, he chases the kicked the ball into the France end but he's not able to get control of it. Mike Fuailefau takes advantage of a French yellow card and scores Canada's first try of the match just before the break. In the second, Kay gets an offload from Cole Davis and dashes over the line to put Canada in the lead. France quickly answer with back to back tries, securing their victory over Canada 17-12. Canada win their first match of the Sydney Series, 24-14 over Kenya. In just his second sevens tournament for Canada's national team, Cole Davis starts the match off with two tries. After a Kenyan score, Connor Braid powered past the line to put them up 17-7 at the break. A lot of back and forth in the second half with Kenya racking up the penalties but Canada not able to capitalize on any of them. Finally it was Phil Berna who subbed into the game and scored the final try of the match. Nathan Hirayama's two conversions gave Canada the victory 24-14. Canada lose to the USA by a score of 36-14. Canada came out flying off the kick off but couldn't convert. USA took advantage of any holes in the defensive line to score three unanswered tries in the first half. Canada regrouped in the second and pushed forward with Connor Braid eventually crossing the whitewash to put Canada on the board. Pat Kay came blazing in off the restart, snatching the ball out of the air and going on a run to give Canada their second try of the match. Nathan Hirayama added on two conversions but it wasn't enough to stop the speedy USA. Back-to-back tries finished the game, giving them the win 36-14. Canada finish third in their pool and move on to the Challenge Trophy quarterfinals against Scotland. Kick off is at 7:44pm ET/ 4:44pm PT. 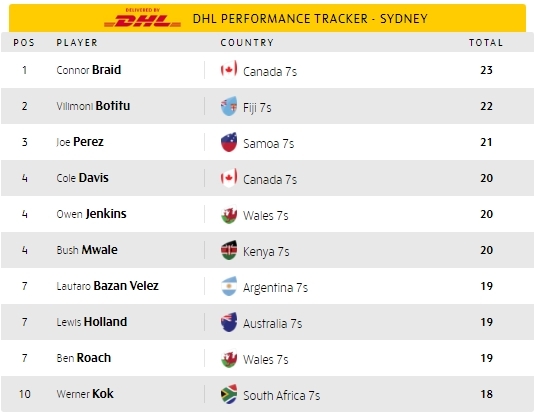 Canada kickoff the Sydney 7s on Friday 14:44 PST against Kenya. Kenya have an athletic team but inexperienced as many of their 7s stars are in a labour dispute with their union. They defeated Argentina on Day 2 of the tournament so aren't to be taken lightly. Next up is France, a team with experienced Top 14 players but who have been hot and cold in their 7s performances. Canada face them at 20:12 PST. Canada's final pool match is against USA in the early hours of Saturday morning on the west coast at 00:39. The bad news for Canada is their speed man, Justin Douglas, is out with a concussion. The good news is their play maker, Nate Hirayama, should be recovered from his bicep contusion and able to play. Brock Webster will be included in the match day 12 and will likely get his first cap during the tournament. Cole Davis got his first cap and first try last weekend at the Hamilton 7s in NZ. Josiah Morra will likely be the 13th man on Day 1 of the tournament. CBC Sports will be streaming the matches. The women start today at 17:22 PST against Fiji.